Located in Rockingham WA, near Rockingham Shopping Centre. Established in 1983. 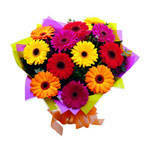 Fresh flowers for all occasions - gifts, weddings, funerals and special events.